My entire collection started with the concept of Portia. 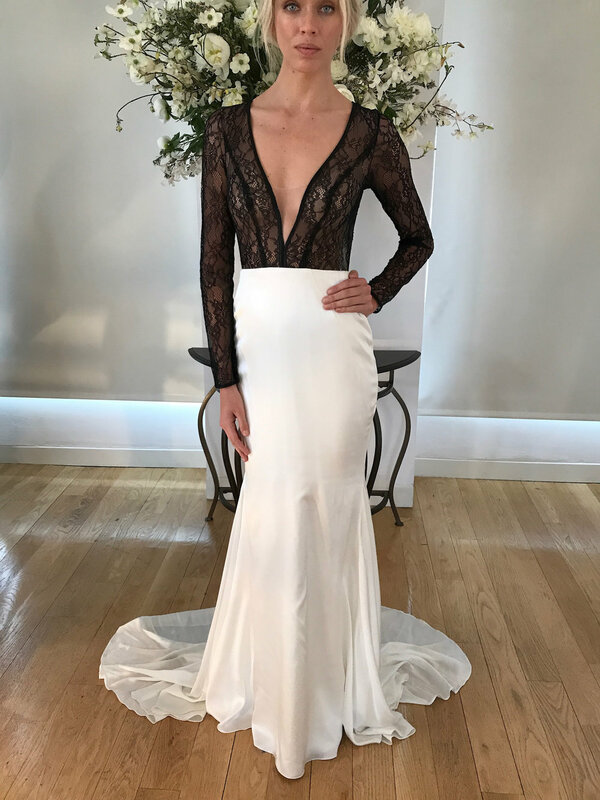 When I thought about Shakespeare, I thought about dark romance, which led me to Portia’s stunning black sheer illusion lace bodice and sleek, ever-so-perfect ivory silk stretch satin skirt. I chose the finest, most delicate Chantilly lace I could find for the bodice. It translates so beautifully in black that when you look at Portia, you think “chic,” “stunning,” “elegant,” and not “black.” There is something so special about this black lace that cannot be captured by words. Once you try this gown on, you won’t be able to resist it. While my heart went on a wild streak with this extraordinary black lace, I didn't forget about my ivory loving girls. Portia is also available in ivory lace, as well. Unsurprisingly, it’s just as breathtaking in all ivory as it is in bicolor. A fabulous dress is all in the details. Tiny bias bands of satin echo the softly curved plunging neckline, accent the waist, and punctuate the sleeve cuffs. Covered buttons on the sleeves and the illusion back add an artistic touch, and silk stretch satin contours each curve of the body in the most perfect way and feels regal. After slipping on the Portia, you will want to say yes to this dress!